To have an old ally frame shotblast, phosphated and powder coat cost me approx £25. It's also worth considering having a clear top coat, for a glossy finish. Twas a local outfit to me, who specialises in automotive Alloy Wheel refurbs and luckily for me does the odd bike frame. Only drawback at that price was I was limited only to the colours they had in. I've heard tell of prices as low as £10-15, if you're prepared to have it done whatever colour another customer has ordered for their job. that included having the frame dipped / blasted, phosphated (anti-rust) and powder coated. the finish is very nice. Many years ago when I was young teenager and very poor but had the enthusiasm and imagination that goes with youth, I drilled a small hole in the back of an empty aerosol spray can and soldered onto it a woods valve from an old inner tube. By taking out the core of the valve, I filled the can with a 50/50 mix of enamel paint and thinners and then used my bike pump to pressurise it. The finished bike frame (after some practice spraying) was the envy of my biking mates. P.S. Watch the grit blasting, - can be very abrasive you might loose a quality frame. Which makes me wonder... Does anyone make a pump-up spray gun/airbrush? If I want to mix my own paint and/or add my own substrate to the mix, I need a spray gun, not a rattle can. But the spray gun I bought the other day for occasional spray jobs like this uses screw in tins of propellant. But they give me no idea how much coverage they will provide. OK, I can take an educated guess, but Sod's Law says that I will run out of oomph 93% of the way through one of the coats. So I'll have to buy a whole bunch of propellant tins just to make sure. And I doubt that they are purely compressed air, so that's unnecessary cheicals added to the atmosphere etc. etc. So OK, the tins will give a lot more spraying time than a pump up air reservoir. But the advantages of being able to just attach my stirrup pump and put some life into the cannister on a constant basis would far outweigh the short spraying duration disadvantages. I tried a quick google, but apart from the Ronseal fence sprayer (which I feel it would be hard to get a good finish with! ), nothing is jumping out at me. Anyone seen (or better still, used) a spray gun like this? A spare tyre as air reservoir for airbrushes is common - I ran my little Badger like that for a while. But an artists' airbrush for coating, rather than detail, is insanity. I'm thinking about coverage *and* detail really. I'd be interested in owning both a spray gun and an airbrush. 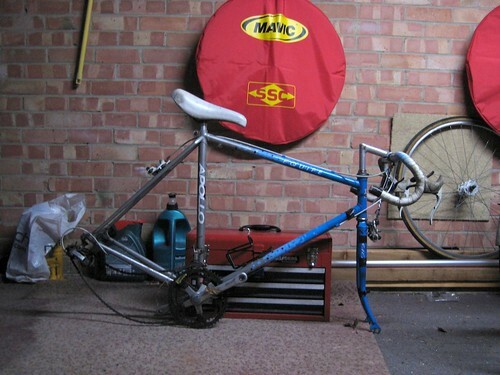 I have several old rides that are in need of some TLC but aren't valuable enough to send to Armortex (they are the "don't bother trying to steal me" bikes for parking in dodgy areas). I used to paint and draw a lot, so I've been thinking about trying my hand tarting up those old bikes. If it looks rubbish, they'll still look better than they do now. So cheap, simple kit that requires minimal setup time which I can start furtling with seems an ideal starting point. If you buy a poorly-marketed slightly tatty example mid-week, give it a good clean up, take good pics, get it back on Ebay ending sunday pm you'd probably be able to turn a profit. Screwfix sell cheap airbrush kit, I think my compressor cost me 35 quid and the airbrush and paint container about another 25. Of course if you decide to keep the compressor you can then get all kinds of fun air tools like impact drivers and NAIL GUNZ. How many coats would be considered reasonable for a rattle-can respray job? 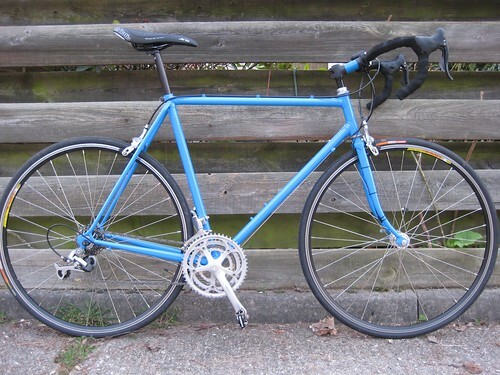 I've never resprayed an item like a bike, which is going to get clunked into bike stands etc. And if I skimp on the paint am I asking for it to flake in 5 minutes as soon as the bike starts seeing some use and abuse? Will extra layers help that, or is it all about the lacquer? And how many coats is enough, how many is too many? I guess there's plenty of "how long is a piece of string" in those questions, because there are variables like how thickly the paint layers itself etc. But I have some spray paints that I intend to use to repaint an old utility ride. The primer will cover me for 3 coats of the whole bike. But then when it comes to the paint, I'm stuick as to how many coats I should give that? I was guessing at 4 layers of paint and then maybe 2 or 3 of acrylic laquer depending on how it lays itself down (test sprays make it look like it layers pretty thickly), but is 4 coats being miserly on the paint layer? Would 6 coats of paint going over the top? That'd be 12 layers of assorted "stuff" on the frame in total - which seems a bit OTT to me. How many coats of what did you give your rattle-can paint job? And how well did it last? It also depends on the kind of paint you are using. this is one I have done this week, the under coat went on very well nice and thick and I put the top coat on last night again I always try to get a nice thick coat of colour on and then tonight I will lacquer it. The paint I used for this is plasti-coat there are only two top coats on this as that's all the paint I had, with this paint you have to respray again within 4 hours or after 36 hours or it wrinkles. If I was really bothered about durability I would do at least two undercoat, three to four top coat depending on what sort of finish you are achieving then sand it back, then lacquer it with at least two coats. I don't reckon you need more than two coats of primer, four coats of paint and two coats of laquer - but more important is the preparation and the method of application. A bike shop bloke once advised heating the frame before painting to have better adhesion. Each coat must be thin and allowed to really dry before the next is applied. You need to spray from some distance and with plenty of speed to get the coats thin, and don't be tempted to keep going over and over. Do it outdoors and wear a mask. But still be prepared for it to chip off more easily than a professional job. Frankly, DIY spray-can painting is more suitable for bikes you're selling rather than keeping for yourself! I can't remember how long it lasted when I used to do it, except it wasn't long enough. One tip I read is to spray a frame at the beginning of summer, then make a sort of box for it in the garden from black bin bags and leave it in there on sunny days to bake it and speed up the hardening process (which can take months with DIY jobs). If it's a scruffy hack bike, then Smoothrite. If it's a general utility/winter bike, then a cheapo enammelling or powder coat from a place that does radiators and stuff. If it's decent then use a high-end bike re-enameller. Doing a great-looking job with spray-cans at home is just a waste of time and effort. And money. That's what I reckon from my experience. Plus you end up with coloured dust everywhere, as I did when I did it in my mum's garage. I no longer have a garage and wouldn't spray in my flat, nor outside. I've just used a paint brush and tin of paint. Just as good as expensive spray cans and a fraction of the cost. Much less hassle and much cleaner. Still a crap job though, but I could probably do a better job if I had more time and patience at the time. I've done it on old bikes. 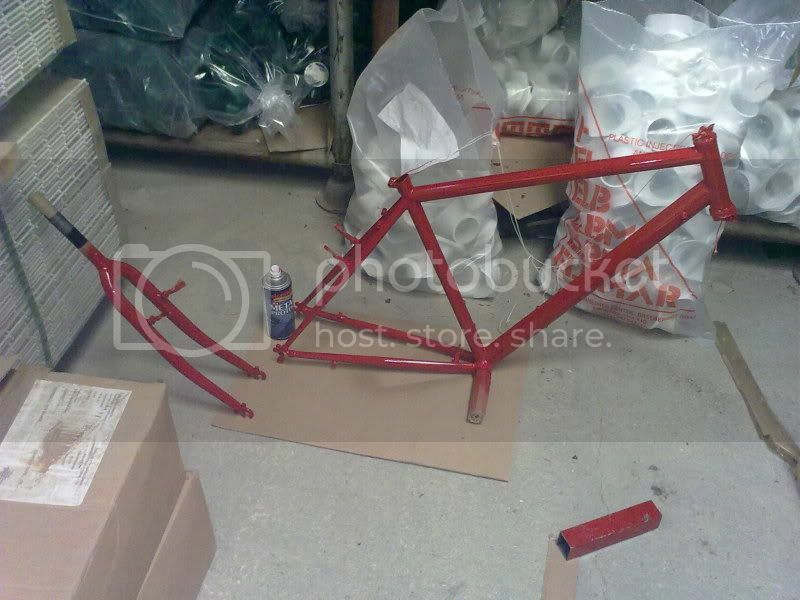 It's either re-paint the old frame or pay almost what the frame is worth just for a coat of paint. My £5 tin of paint that has painted about 3 frames still has lots left. Aerosol cans are very expensive. The other option is to buy the proper kit, but that's only worthwhile if you're doing a hell of a lot. I've used spray cans since the 70s when it was the only option. I'd prefer powdercoating now, but it's too expensive where I live. £25 for a colour that's already being done, £40 for my choice, and that's before another £25 for shot blasting. That's £65. The last bike I sprayed cost me £26 off ebay, a nice Saracen Sahara SE. I spent about £26 on spraypaint, and though the coating isn't as tough as powdercoating, it's beautifully smooth, due to rigorous sanding. I know it's a lot of work, but, frankly, I enjoy it. My tip for a good finish is primer, leave 24hrs, check for defects, sand and respray, leave 24hrs, base coat, leave 24hrs, any defect that show up here, wet and dry, leave 24hrs, top coat. I can usually get away with one big can of primer and two, sometimes three cans of paint, depending if I'm just doing frame, or frame and forks. But like I say, I quite enjoy it, so it's not really a bind. That sounds very reasonable indeed to me, considering you're paying someone's wages and that it's more durable than a home spray job. On the other hand, I would consider buying a whole new frame instead, if the frame is basic. I'm looking at £120 to have mine Argossed. I can't remember what it cost to have the Brompton done at Argos because my mind has censored it. 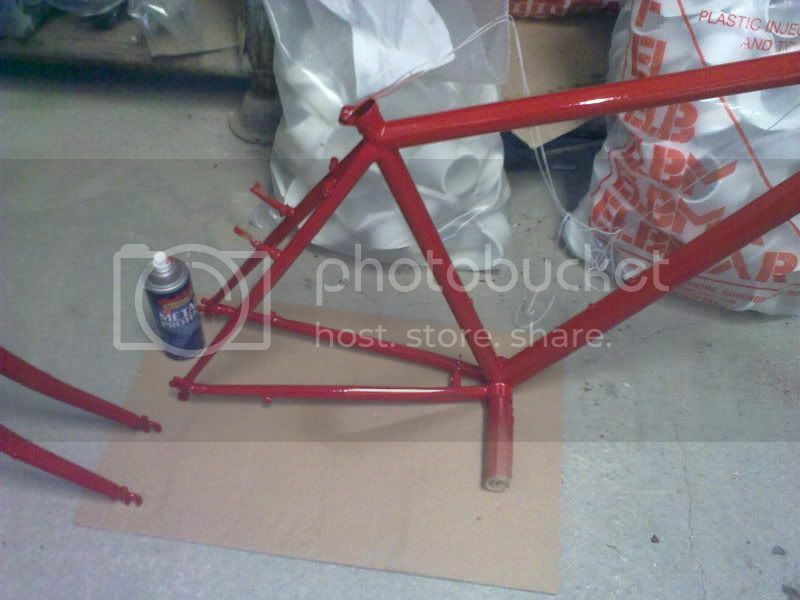 It was only the main frame and stem, too, but flam red isn't the cheapest. I am torn between Mario Vaz for enamelling and Armortex for powdercoat. I suspect they are similar prices. £140 for f+f in flam red!